If you work in a job that requires heavy lifting, or standing on your feet all day – such as construction or food service – or you’re just not at the peak of physical fitness, you are prone to muscle and ligament strains. This condition can cause spasms during activity or rest, stiffness, reduced range of motion, and persistent pain. Bed rest and nonsteroidal anti-inflammatory medications are typically adequate for treating strains. As we age, our bones become porous and brittle; the spinal vertebrae are no exception. In fact, about half of the 1.5 million osteoporosis fractures each year are vertebral compression fractures. It’s often said that Osteoporosis goes from undetected to unbearable. Low-impact exercise (especially those that increase core strength), abstaining from smoking, eating healthy, and consuming bone-boosting vitamins – all can help prevent the pain that has become synonymous with Osteoporosis. Sometimes structural deformities of the spine can lead to pain over time. Scoliosis – or an abnormal curvature of the spinal – may put a strain on the muscles of the back, ultimately leading to pain and discomfort. This (most often) congenital disease is best treated early, especially in childhood when the spine is most malleable. Nipping scoliosis in the bud through the use of back braces targeted exercises, and hydrotherapy or massage can prevent curvature and pain in the future. One common cause of back pain often goes undetected until it has progressed to the point that the pain is debilitating. 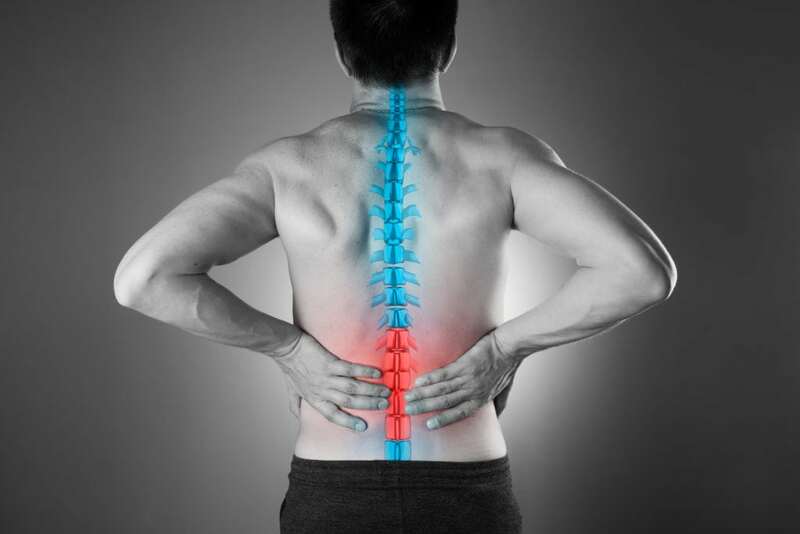 Each of our 33 spinal vertebrae has between them a spinal disc that contains a jelly-like substance called mucoprotein that expands and disperses when our spines sustain harsh impact. However, sometimes age and wear-and-tear cause the hard, outer layer of the disc to expand beyond its border; this phenomenon is referred to as a bulging disk. Should the disc’s soft inner layer seep out of its shell, a herniated disc can occur. When the inner layer expands enough to tap on or put pressure on nearby nerves, you can expect numbness and tingling in fingers, legs, and feet; as well as a good deal of pain. Most people associate arthritis with the hands; and with writing, cooking, gardening, and all of the other complex activities performed by the hands – it’s no wonder why. However, the back is another region affected by arthritis. Spinal stenosis, a condition marked by a narrowing of the spaces between the spine, is attributed to Osteoarthritis and often occurs in people over the age of fifty. Neck and back pain, numbness or tingling, and problems with walking and balance are common symptoms of spinal stenosis. Rheumatoid Arthritis can is an auto-immune disease that can also affect the back. Backpacks and heavy purses. Do you carry heavy or bulky items? If so do you carry them on one shoulder? This habit can result in back pain by forcing you to lean to one side, causing strain on the back. Consider wearing backpacks over both shoulders, high on your back, or using wheeled bags to pull your gear, thereby reducing strain on your back. If you wake up with constant back pain, it could be a result of an old or improper mattress. When looking for a good mattress, channel your inner Goldilocks to find one that is “just right.” If a new mattress isn’t in your plan right now, try placing a board or supports underneath your mattress to reduce bulges, bumps, and dips. Are your shoes providing you with the right support? Over time sneakers do flatten out. Likewise, you may not be wearing the right shoe for your activity. Inserts such as orthotics can help realign your stance, taking pressure off your back. Oftentimes we tend to capture stress in certain parts of our bodies by tensing up. Try to relax and see if your back feels any better. If you find your back hurting from sitting for hours at your desk, try an ergonomic approach. Ensure your monitor is at eye level so you don’t have to look down. Consider a standing desk, and make sure you are not reaching too far for your mouse. If you don’t work in an office but your job is contributing to back pain, talk to your occupational health office or insurance company about back braces, standing mats, and other safety features for back health. Be sure to take a moment to stretch out or take a walk (vs. sending an email) to engage your muscles frequently. The only right way to diagnose what ailing you is to make a visit to a trusted orthopedic doctor. The board-certified and fellowship-trained surgeons at Orthopedic Associates of West Jersey offer an array of conservative and surgical treatments for musculoskeletal maladies and will provide personalized care based on your unique needs. For more information, call 973-989-0888.